Erythroxylon coca is a densely-leafed plant native to the eastern slopes of the Andes. Coca is widely cultivated in Bolivia, Peru and Ecuador, but the lead producer is Colombia, currently the source of some 80 percent of the world's cocaine. According to ex-New York Police Commissioner Raymond Kelly, "Colombia has probably the best cocaine, the best heroin, and the best marijuana in the world. And the best coffee." Evolutionary selection pressure has favoured the natural synthesis of the cocaine alkaloid. This is because cocaine serves the coca plant as a pesticide. Cocaine powerfully inhibits the neuronal reuptake of the "reward neurotransmitter" dopamine; but cocaine is an even more potent re-uptake inhibitor of the insect-specific neurotransmitter octopamine. Octopamine plays a dopamine-like role in insects: it is released in e.g. honeybees in anticipation of a switch from one flower to another flower offering more nectar. Insects that feed on coca are liable to "overdose" on their own octopamine. Monkeys, sloths and llamas sometimes make a habit of nibbling coca leaves too. The effects are typically benign. Typically, coca thrives in warm, moist, frost-free valleys between 1500 and 6000 metres above sea level. The plant grows to a height of up to eight feet. Bushes are normally planted in nurseries, grown from seed. Harvesting normally begins in the third year. A coca bush can typically yield three harvests a year for another 20 years. Well-cultivated bushes in favoured conditions can be harvestable for 50 years. 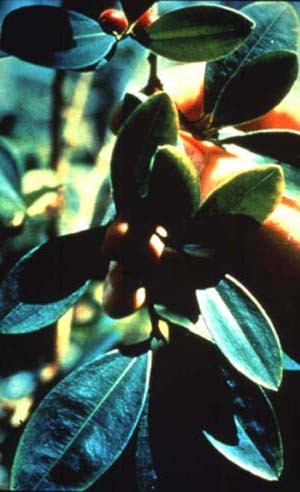 A few venerable coca bushes are reputedly over a hundred years old. .
Coca leaves are rich in vitamins, protein, calcium, iron and fiber. The cocaine content of the leaves ranges from O.1% to 0.9%; like the user, it tends to get higher with altitude. 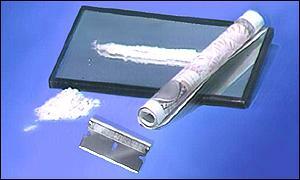 Diurnal fluctuations of cocaine within the coca leaf occur during a 24 hour cycle. High-quality dried coca leaves are uncurled; the upper surface should be dark green and the lower surface grey-green. Chewing coca counters the symptoms of 'mountain sickness' and oxygen-deprivation. The daily dose of the average coquero is around 200mg.